To Sum It Up: When Sophronia Temminnick’s mother decides that her daughter could benefit from more than a few lessons in refinement, Sophronia is sent off to Mademoiselle Geraldine’s Finishing Academy for Young Ladies of Quality. Almost instantly, Sophronia learns that her new school interprets the meaning of “finishing” in an entirely different manner. Her studies include covert information gathering, poisoning, and weapons concealment, all of which she is expected to master along with perfecting her curtsy. 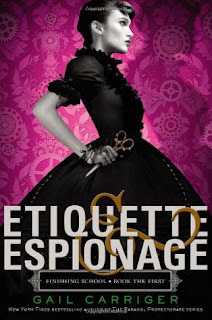 Review: I make zero effort to hide my enthusiasm for Gail Carriger’s Parasol Protectorate novels, so it was a no-brainer for me to check out her YA Finishing School series. Etiquette and Espionage takes place before the Parasol Protectorate, but you absolutely do not need to have read the latter to enjoy the former. Fans of Carriger’s adult books, however, are sure to be thrilled by the connections that are made between the two series. I love, love, love the Victorian steampunk-meets-paranormal world that I was introduced to in the Parasol Protectorate novels, and being able to return to it in Etiquette and Espionage was a pure joy. Plucky heroine Sophronia gets to attend a school that is on board an airship and has an adorable—and mechanical—pet dog named Bumbersnoot. Mademoiselle Geraldine’s Finishing Academy for Young Ladies of Quality also boasts a vampire and a werewolf among its faculty. Add this obviously venerable educational institute to the list of fictional schools I wish I could attend (still waiting for owl post to deliver my Hogwarts letter, dammit!). I’d also have to find a way to sneak into Bunson and Lacroix’s Boys’ Polytechnique because it’s a school that trains evil geniuses. Seriously, this is the school’s specialty. It’s that kind of quirkiness, which is passed off so casually in Carriger’s novels, that makes me laugh my arse off and marvel at her creativity. Off-the-wall character names are another staple of this universe, and I could barely suppress giggles over appellations such as Mrs. Barnaclegoose and Lord Dingleproops. I also had a hearty chuckle at Dimity and Pillover Plumleigh-Teignmott, although the Plumleigh-Teignmott siblings turn out to be quite steady allies of Sophronia’s, especially Dimity, a fellow student at Mademoiselle Geraldine’s. “Sophronia” isn’t exactly a run-of-the-mill name, either, but its uniqueness certainly suits its bearer. Even before her recruitment for Mademoiselle Geraldine’s, Sophronia isn’t the average fourteen-year-old Victorian young lady. Her super curious mind often leads to trouble, but that’s why she fits in perfectly at a school that teaches the fine art of espionage. I’d seen a couple of reviews mention that this book felt a bit middle grade-ish, but I didn’t think so. I will say that it is a tad light on plot. Sophronia’s adventures sometimes seem episodic rather than part of a larger arc. In a different novel, this most likely would have bothered me, but I was too amused by the humor in Etiquette and Espionage to dwell on the thin plot details. This was a delight to read, and I can’t wait to carry on with the rest of the books in the series. All in All: Gail Carriger works her magic yet again, this time kicking off a YA series with a very solid start! I love these books! They are so much fun. I don't think I giggled as much as I have withe Sophronia and her friends. I'm so ready for the 4th one to come out. I love seeing how some of the characters connected to Parasol Protectorate. Have you read Prudence? Prudence is my next read! I've been dying to start but just haven't had the time. I'll never be able to read enough books about this world! I've tried Miss Carriager's books before and had the hardest time trying to get into them. But I think that can be more attributed to the fact that though I like it, I am not overly thrilled by steampunk. But this certainly sounds like an interesting school in this book with some colorful characters thrown in the mix. I am glad that though this book is young adult, Miss Carriager managed to write a book that was enjoyable to you. I love books that are set in Victorian England, so that was a huge plus going in to both this and her Parasol Protectorate series. I also really, really love the humor in her novels. I"ve had this one on my shelves for ages and have yet to get to it, I'm ashamed! I really need to start reading Gail Carriger's books. Soulless has been on the top of my TBR pile for weeks and I still haven't read it yet. I think I might get to this one first though because I'm in the mood for a delightful and fun read and this seems like just the thing. Great review :D and happy reading! I'd wanted to read Soulless for the longest time, so that's why it ended up being my first Gail Carriger read. The Parasol Protectorate series was so, so addictive, and I was glad that the Finishing School series was available as well because I can't get enough of her writing! Oh, I read this over the summer and loved it! I actually have the second book from the library, waiting to be read. Hopefully it’ll be splendid (which I’m sure is a given). I actually do think of this as a MG series, though I’m not sure how it’s classified generally- it seemed like the characters and their expeditions weren’t really up to the YA level, and it’d certainly, in my opinion, be suitable for MG readers, but really it’s one of those books that is widely enjoyable- adults, YA, children alike will all enjoy it because it’s unique and suitable for all, really. I adore that in books. I haven’t read Carriger’s other series, but after the brilliance of this I was certainly considering it, especially since I’d see characters again, in the future, and that’s always rather fun.